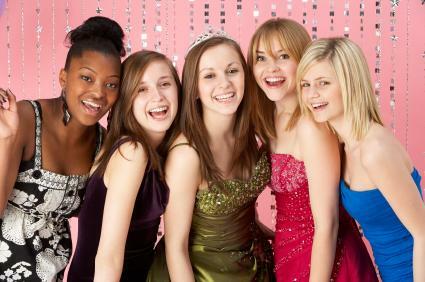 Sweet 16 parties are a fun tradition that celebrates a little girl's transformation into a young lady. Although these parties are considered a rite of passage, they don't have to be complicated or expensive. Choosing a theme will help you plan your party while keeping costs in check. While there's no rule that says Sweet 16 parties must have a theme, choosing one definitely sets the tone for your event. Whether simple or elaborate, themes give you a starting point to use for selecting your invitations, decorations, food, and party favors. For coed Sweet 16 parties, a masquerade ball can be a wonderful theme. Ask your guests to come dressed in formal attire; girls can wear their old prom dresses and guys can either rent tuxes or come dressed in a nice suit. Have your guests decorate eye masks with feathers, foam stickers, glitter, and sequins. Decorate with white lights, candles, and an assortment of fresh flowers. Play a selection of your favorite dance music to set the mood. For food, serve either a formal dinner or an elegant buffet that includes fresh fruit with a chocolate fountain. For a party in the summer, nothing beats a fun Hawaiian theme! Ask your guests to wear Hawaiian shirts, hula skirts, and bathing suits. Decorate the pool area with tiki lights and fake palm trees. For party favors, distribute flower leis as your guests arrive. When it's time to eat, treat your guests to a buffet that includes tropical fruit smoothies, macadamia nuts, and pineapple upside-down cake. Serve mini sandwiches, an assortment of fresh fruit or vegetables, and sparkling water to drink. Another fun "girls only" idea for your 16th birthday celebration involves taking your closest friends to a Glamour Shots photography session. You'll enjoy a memorable afternoon with your friends and take home some cherished keepsakes. If you don't have a Glamour Shots location near you, ask your friends to bring their own selection of costumes to your home. Give each other makeovers and have a relative with a digital camera take your photos. This theme has a lot of flexibility since it can refer to Old Hollywood or a more modern day version of film and Broadway. A theater makes a great venue for this type of party. This could be a movie theater or a traditional live theater. Check local theaters to see if they allow private parties, and then build your logistics from there. Movies are a great source of inspiration for a Sweet 16 party. Movies and Hollywood in general have a huge influence over teenagers. Consider the movies your teen loves. Harry Potter and Twilight are just two influential movies that could make great Sweet 16 party themes. High School Musical and Hannah Montana are great television-inspired themes. If you decide on a movie party at your home, decorate with tons of movie posters and serve snacks such as popcorn, peanuts and candy. The cake can be decorated to match this theme and be served as dessert. 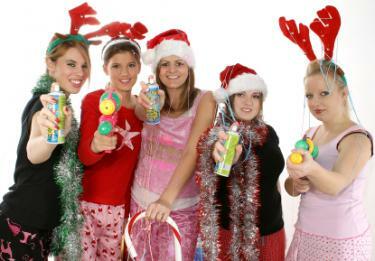 Most teens love the holidays, whether it's Christmas or Valentine's Day. If the birthday falls close to a major holiday, it could be fun to throw a holiday-inspired party. For Christmas parties, all gifts could be wrapped in Christmas paper and decorations could include twinkle lights and Christmas trees. Likewise, a great Halloween-inspired party would require guests to wear costumes and call for decorations that lean toward the spooky and surreal. Lucky 16 year-olds often get a car for this momentous birthday. If that's the case, consider throwing a car brand-inspired party. This can work especially well if the teenager is unaware that she is receiving a car or doesn't know the make and model. Car-themed decorations can heighten the suspense and help create a fun evening for everyone involved. Many teenage girls are into school sports. Rent out a local gym and host the party with sports decorations and favorite tailgate foods. If it's a team sport, consider holding a scrimmage for guests that want to play. If you do this theme at home, ask each guest to wear their favorite team's colors or a sport themed jersey. Many young women long to feel like a princess on their special day. Consider working this secret wish into the Sweet 16 theme. Young ladies can wear full-skirted dresses and tiaras. Young men can look dashing in soft-hued tuxedos. There are many ways to decorate for a princess party theme, but the most important part is the venue. A place that feels lavish or luxurious works well for this type of theme; consider booking a small hotel ballroom for the event. For an added touch, pick up the birthday princess in a limo and have her arrive in style. While it's certainly an occasion worth celebrating, Sweet 16 parties shouldn't be as elaborate as a wedding. The main goal should be to celebrate the birthday girl and the fact that she's growing up. As long as the party includes her friends and family, good food, decorations, and entertainment, she'll be happy.